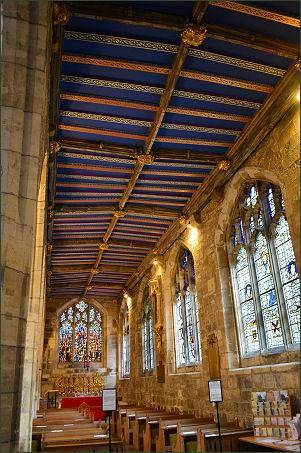 St. Martin le Grand Church, York . St Martin le Grand church is situated on the south side of Coney Street and was referred to as 'One of the most beautiful churches in the city' in The National Gazetteer of Great Britain and Ireland, of 1868. 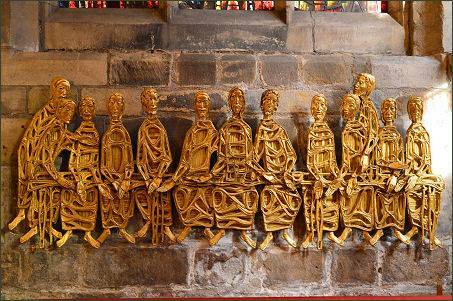 The church dates back to the Norman era, it was founded in the late eleventh century. It was extensively rebuilt in the fifteenth century, however fragments of masonry from the Norman period still survive in the fabric of the building. The church is dedicated St Martin of Tours, the patron saint of soldiers. 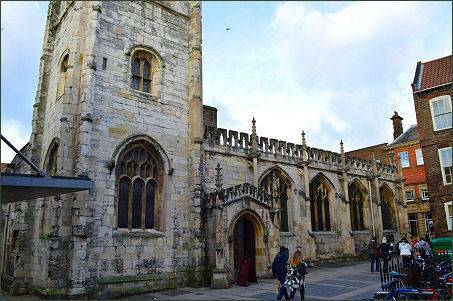 With its impressive landmark double-sided clock, topped by the eighteenth century 'Little Admiral', St Martin-le-Grand has one of York's most distinctive and charming facades. 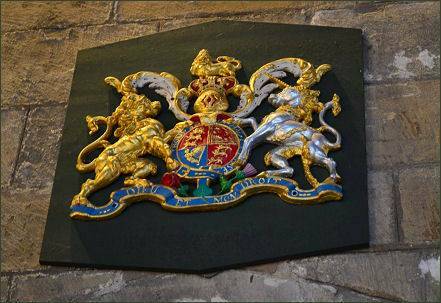 In 1730 when the Mansion House, was built nearby as the residence of the Lord Mayor, St Martin's became the official civic church. 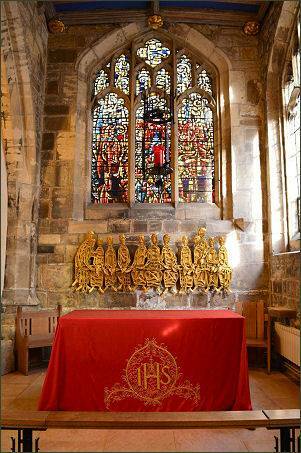 The great west window dates from around 1440 and shows scenes from the life of St Martin. This great wall of glass is 9m high and 4m wide, and is the largest window of any parish church in the city. 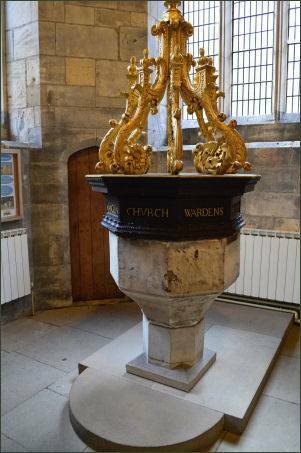 The church font, which was used during the baptism of St Margaret Clitherow, dates to around 1553. the font's cover is of a later date of 1717. In 1942 the church was reduced to ruins during a German bombing raid on York. 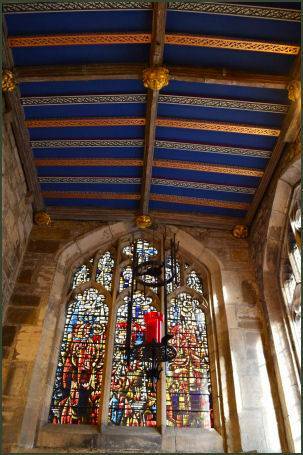 Restoration work under by JB and W Atkinson of York commenced in 1961, until that time the church had stood in ruins. Fortunately, the large fifteenth century St Martin window had been removed for safety in 1940 prior to the raid. 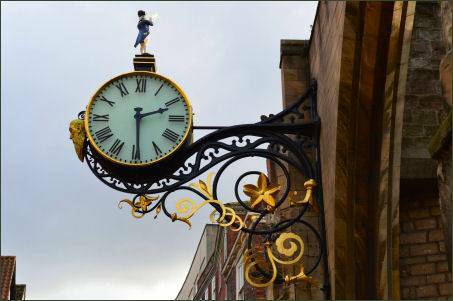 The clock, first fitted in 1668, and the gilded head of Father Time are replacements for the originals destroyed in the air raid. The'Little Admiral' however, survived the fire.